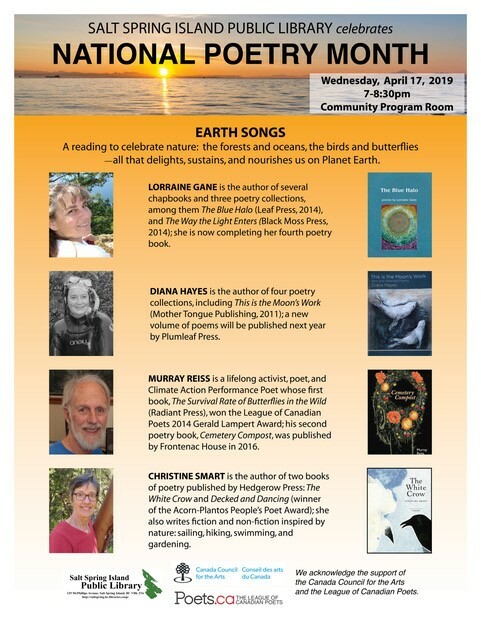 Earth Songs: Celebrating nature in all its forms: the forests and oceans, the birds and butterflies—all that delights, sustains, and nourishes us on Planet Earth. Christine Smart is the author of two books of poetry published by Hedgerow Press: The White Crow and Decked and Dancing (winner of the Acorn-Plantos People’s Poet Award); she also writes fiction and non-fiction inspired by nature: sailing, hiking, swimming, and gardening. Diana Hayes is the author of four poetry collections, including This is the Moon’s Work (Mother Tongue Publishing, 2011); a new volume of poems will be published next year by Plumleaf Press. Lorraine Gane is the author of several chapbooks and three poetry collections, among them The Blue Halo (Leaf Press, 2014), and The Way Light Enters the Earth (Black Moss Press, 2014); she is now completing her fourth poetry book. Murray Reiss is a lifelong activist, poet, and Climate Action Performance Poet whose first book, The Survival Rate of Butterflies in the Wild (Radiant Press), won the League of Canadian Poets 2014 Gerald Lampert Award; his second poetry book, Cemetery Compost, was published by Frontenac House in 2016. We acknowledge the support of the Canada Council for the Arts and the League of Canadian Poets.